Myth: French toast was invented in France. French toast was not invented in France. In fact, French toast was around long before France even existed as a country. The exact origins of French toast are unknown, but it isn’t surprising that humans seem to have come up with the recipe quickly, given that French toast is traditionally made out of stale bread. Bread has been a staple food for most cultures since food first began being prepared and, up until very recently, the vast majority of humans would have never dreamed of wasting any food; thus, one has to find a way to make stale bread palatable. Soaking it in milk and egg and then cooking it, seems logical enough, making a good tasty meal while not wasting any bread. The earliest reference to doing just this dates all the way back to 4th century Rome, in a cookbook attributed to Apicius, and it is thought to predate this work by a good margin. This style of “French” toast was called Pan Dulcis. The Romans would take the bread and soak it in a milk and egg mixture, and then cook it, typically frying it in oil or butter, pretty much just like it’s made today in many countries in the world. This practice became common throughout Europe in the Middle Ages, including making it primarily out of stale bread. Indeed, the name for French toast in France itself is “pain perdu”, which literally means “lost bread” (it is also called this in Belgium, New Orleans, Acadiana, Newfoundland, and the Congo, among other places). It’s interesting to note, for the naysayers who like to cling to the belief that it came from France, that before the French called it pain perdu, they called it “pain a la Romaine” (Roman bread). Another popular myth as to the origins of the name “French toast”, perpetuated in such publications as Why Do Donuts Have Holes, is that French toast actually came from America, specifically, being created in 1724. The name “French” came from the chef who first made it, Joseph French. Supposedly, Mr. French was bad at grammar and when he named it, simply forgot the apostrophe, as in: Frenchs toast, instead of French’s toast. Alas, if only the Grammar Nazis of the day would have corrected him. This story, of course, is pure fiction as there are numerous references throughout history of what is now called, in North America, French toast. Indeed, there are numerous cookbooks from the middle ages throughout Europe that even give the classical recipes for French toast. Further, the name “French toast” pre-dates the 18th century, with the earliest references popping up in the mid-17th century, before the story of the grammatically inept Joesph French. Before that time, it was also known as German toast, Spanish toast, and a variety of other names, only some of which had anything to do with the name of a country. While the vast majority of people throughout history seem to have made their French toast from stale bread, the upper class members of society don’t appear to have done the same. Most cookbooks for this group tended to make it from very highly enriched white bread, which was much more expensive than whole grain bread through most of history, ironically enough, considering today it’s the opposite. Other names for French toast around the globe include: Eggy Bread (Britain); Gypsy Toast (Britain); Poor Knights of Windsor (Britain)… (there are many more from Britain, but I’ll just stick with those three) ;-); Rabanada, served as a Christmas dessert (Portugal and Brazil); Torrijas, served as an Easter dessert (Spain); Bombay Toast (Sri Lanka and Burma); and Mozzarella in Carrozza (mozzarella in a carriage) (Italy). In Italy, French toast is made by taking two slices of bread and embedded mozzarella in between them, then dipping the sandwich in whipped egg and frying in the typical French toast fashion. This version of French toast is then often topped with tomato sauce and cheese. Obviously this is not considered a breakfast food in Italy. In India, French toast is made without sweeteners, typically being made with egg, milk, salt, green chili, and chopped onions and generally served with ketchup. In Spain, they make it by soaking thick slices of bread in either wine or milk and then dipping it in egg and frying it up. Toppings then typically include honey and/or cinnamon. The Portuguese still keep the tradition alive of making French toast out of stale bread. They typically make it as a Christmas dish out of stale slices of bread and make it entirely in the traditional fashion of soaking the bread in a mixture of milk and egg, then frying it in butter or vegetable oil. Toppings then often include sugar and cinnamon enriched syrup. In France itself, French toast is highly sweetened and is served as a dessert item, rather than served for breakfast, as in America and many other places. As mentioned, it’s only been a recent thing for a large group of humans to commonly waste food. French toast isn’t the only food that seems to have come from the practice of using up every scrap of food. Fondue seems to have also been created this way, being traditionally made out of old hardened cheese and dried out bread. Throughout history, in Europe, most food scraps would be taken and thrown into a pot that was nearly always kept simmering to keep the food from going bad. This mix-stew made for quick meals throughout the day and served as a great way to make sure every scrap of food would get eaten. Interesting. 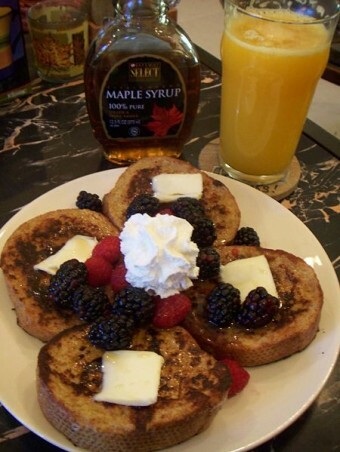 I always assumed French toast was “invented” by early North American colonists (as in voyageurs) because of the most common topping being maple syrup, which is of course a New World food. I wonder what the ancient Romans topped their French toast with, if not maple syrup? French toasts are not made with maple syrup in France. Quick correction: I don’t think you intended to leave a grammar mistake in a sentence about “grammar nazis,” did you? Actually, in America, we called it German Toast until WWII, when we went to war with germany, people were boycotting everything German, so the people that didn’t want to give it up changed the name (the French were allies at the time). The heading for the “American Toast” para is “1187”, but I think you mean “1887” just as the citation at the end of the para indicates. Thanks for this interesting and entertaining essay! Looking at my kitchen after the kids make it, ketchup and all, I like to call it “Trench Toast”. Think it might catch on? I’ve never made french toast from a recipe as it is such a simple dish … and I mention that because I have never before heard of anyone adding sugar or any other kind of sweetener to the batter itself (i.e., the egg and milk mixture). My parents & grandparents did not always use milk either … sometimes it was just whipped egg. Of course, something sweet was always added after the bread was fried … usually syrup, often powdered sugar, sometimes whipped cream. But that was always after the slices were cooked, and never added into the batter. It’s not only a simple dish, there are a lot of inventive recipe for “pain perdu”. Many ingredients can be added to the enriched recipe. Looks like the recipe my mom used was the oldest one (4th century Roman), except we’d top it with maple syrup rather than honey at the end. She didn’t remove the crusts though. We never had an objection to bread or toast with crusts. So it’s not, if you add maple syrup, it’s not the same recipe anymore. There’s two versions of the pain perdu, there’s a sugary version, as a dessert, and a salty version, as a course. As French are also the sons and the daughters of the Roman (not only the Italians as people often think), because of the Roman invasion, it’s not surprised it was Roman, then French. To avoid the waste of the old bread is not new, but there are a bunch of different recipe and each country has its own, so there’s also the French versions.